Within the Mission Ridge Ski Area Boundary, uphill travel is permitted only on designated routes when conditions do not adversely impact avalanche mitigation, grooming, snowmaking, parking, snow removal, maintenance or other ski area operations. Uphill travel is restricted within the Special Use Permit area during periods of avalanche danger or avalanche mitigation. Uphill travel is always closed within the Ski Area Boundary on designated trails and runs between 7:00 a.m and 5:00 p.m. on operational days and anytime while lifts are in operation. Uphill users need to be off of the mountain and back in the base area by 7:00 a.m. The designated routes may be closed at any given time due to safety or hazardous conditions. These conditions include but are not limited to; avalanche danger, mitigation work, construction, snowmaking, grooming or maintenance operations. Winch cat operations may take place at any time on the mountain and will be marked with signs. Stay far away!!! EXTREME DANGER. Runs undergoing winch cat operations are CLOSED to uphill and downhill travel. If Bomber Bowl and the standard uphill route is closed due to winch cat operations then uphill skiers can use Tumwater and Sunspot to reach the top of the mountain. Vehicles must be parked at the Lake Clara Trailhead parking area at the entrance to the lower parking lot. Cars parked in other areas impede our ability to plow the lot and will be towed. No trespassing on Mission Ridge structures and developments during non-operating hours. Dogs are not allowed within the Ski Area Boundary and are never allowed on the Designated Routes during winter operations (including days when the lifts are not operating). Uphill travelers must be visible (by wearing headlamps during hours of darkness). Yield to all downhill traffic whether person or machine. Uphill travelers must stay on the trail edge --'uphill right on Bomber Route and uphill left on Chak Chak Route '. Once Mission Ridge has opened for the ski season any terrain that is closed during operations remains closed to entry even during non-operational hours. Closed terrain is closed at all times. Uphill travelers are subject to RCW 79A.45.030, Your Responsibility Code and other Mission Ridge rules and policies. These routes are open at 5:00 p.m. on operating days and are open until 7:00 a.m. unless the policy is closed or restricted. Uphill users should make route plans that allow them time to be back in the base area no later than 7:00 a.m.
From Midway, uphill travel follows Bomber Run to North Bomber to the Boundary Road. See attached map. Downhill Route. Reverse of the uphill route skiing to the skier’s left side of the run down Boundary Road, North Bomber, Bomber to the Summer Service Road (snow permitting otherwise ‘skier’s right’ of Mimi). All off-piste terrain lying to skier’s left of Bomber is also available for the descent, but only if that terrain is open (off-piste terrain the Ski Patrol has marked ‘closed’ cannot be used as a downhill route). Uphill Route #2 follows uphill left of the Chak Chak ski run to the top of Chair 4. Begin this route at the east edge of the parking lot in the base area (behind the RV parking lot). Hike up the lower portion of the Outback (passing through the center opening in the fence) then head to the lower Chak Chak ski run. See attached map. Continue upward on the uphill left of Chak Chak to the top of Chair 4. Uphill travel into Bowl 4 from the top of Chair 4 is not allowed. Downhill Route. Reverse of the uphill route staying to the skier's right edge of the run, finishing near the RV parking area. All off-piste terrain skier’ right of Chak Chak is available for downhill traffic, but only if that terrain is open (off-piste terrain the Ski Patrol has marked ‘closed’ cannot be used as a downhill route). On Closed days (typically non-holiday Tuesdays and Wednesdays) any area that has been opened for skiing is available for uphill use with the exception of Tumwater, Toketie and Skookum, which remain closed. Rules of Use (above) apply. Even when the Designated Routes within the Ski-Area Boundary are closed (e.g., early-season conditions, avalanche control, ski area is operating, etc. ), two backcountry routes outside of that boundary remain open at all times and can be accessed from the Mission Ridge Ski Area. One of these routes uses the Lakes Trail to access Clara Lake and the Mission Peak environs; the other uses the Outback to access Stemilt Basin. For both of these routes, park at the entrance to the lower lot as close as possible to the Lakes Trail Trailhead. Use of the Backcountry Routes is allowed even when the Designated Routes within the Ski Area Boundary are closed. Uphill skiers using the Backcountry Routes cannot descend to the parking lot via the ski area if the Ski Patrol has closed the terrain being used to enter the resort. Click here for more details about the Backcountry Routes. Backcountry travelers are encouraged to check in with the Mission Ridge Mountain Patrol when leaving the Ski Area Boundary. Mission Ridge requests that backcountry travelers park outside the Mission Ridge parking lot at all times. Overnight camping is not permitted within the Mission Ridge Permit Area. Overnight RV camping is permitted in designated zones in the base area. The Mission Ridge Ski Area recognizes the enthusiasm of the public to be outdoors enjoying the mountains while participating in different activities. Since 2004, the ski area has experienced a rapid increase in winter snowshoeing, snowboard hiking and the use of alpine touring equipment as a means of uphill travel to access terrain in and outside the resort's Permit Area. This type of recreational use raises safety concerns during operating hours and during non-operational hours when maintenance operations or avalanche mitigation may be occurring. Maintenance operations routinely occur on the mountain during all non-operating hours. Machinery can be found working anywhere on the mountain at any time. This policy helps mitigate safety concerns of recreational use during maintenance operations, while allowing recreational access to public lands. 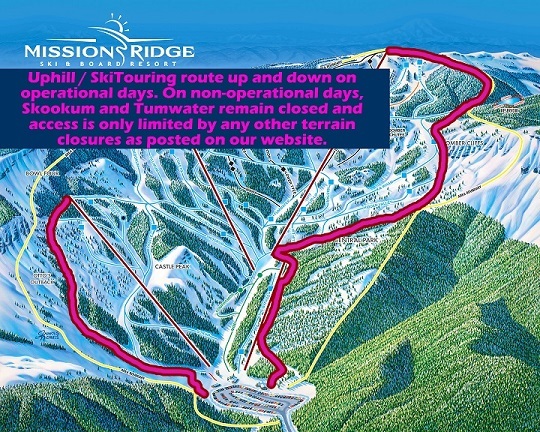 Mission Ridge asks uphill skiers to respect the work of our grooming staff by following the designated uphill routes, knowing the policy, and by skiing downhill via the same uphill route or skiing entirely off-piste. As a courtesy and general practice, please avoid freshly groomed runs -- skiing these runs damages our product and if skied at the wrong time can even create significant safety issues for guests the next day. If you have questions or comments on the uphill policy, we encourage you to contact us at: info@missionridge.com anytime and we will get back to you as soon as we can.